The so-called Gateway project, which would cost as much as $13.5 billion, would increase rail capacity between Newark, New Jersey's Pennsylvania Station and Manhattan's Pennsylvania Station. Federally run Amtrak and New Jersey Transit share two 100-year-old tunnels under the Hudson River. Delays are common because of high over-use. Amtrak's engineers say the only place to bring the new tunnels into Manhattan is under the Hudson Yards site in West Midtown, according to Schumer, a Democrat. He spoke at a breakfast sponsored by the New York Building Congress, a trade group. A plan by developer Related Companies for the Hudson Yards site foresees construction of a residential, shopping and office complex over the site's active rail yards. Construction is to start by the end of this year. "We will need contracts, design plans and construction dollars to flow over the next six to 12 months to make this a reality," Schumer said of the rail project. He wants the digging of the tunnels to start before the end of 2013. May the political winds be with Schumer on this. Not a fan or supporter of the west side yard project. I feel its sole purpose is to justify Moynihan. I will say, that this is a far better project than ARC. I'm just sad we can't get 1-4 through to the east river tunnels. That would be HUGE. I know projects like these have to go through studies to see how it affects the environment, how to build, etc... but sometimes it gets ridiculous spending millions on studies for 10+ years and getting nothing constructed. Maybe we should ask the French, Swiss or Japanese to build the tunnels for us? They can get things built fast(compared to here at least) without having to cut corners and have shoddy construction. neroden wrote: May the political winds be with Schumer on this. Any "political winds" regarding the Gateway project are emanating from Chuck Schumer's own mouth, which is open 24/7/365. This project has no real support in Congress and Schumer is the only one still bumping his gums. Truth be told, the real problem is that NJT is just running too many commuter trains into NYP, but the tunnel project is beyond the means of NJ, and even NY and NJ together. It's not an Amtrak or a Federal issue, except that during the financial difficulties of the last decade, Amtrak allowed NJT to run too many trains into NYP. If those trains were empty I'd agree with your twice mentioned "too many". Are there passengers on the trains NJT runs into Penn Station? If so, why do you say there are too many trains? What do you expect those former passengers to do if someone stops running the trains because there are too many? I didn't like ARC, but this project needs to get done. I'm with Chuckie on this one, and I think everyone knows how I feel about Chuckie. Otherwise, it's time to take cars of the lower deck of the GW and put trains in (Bobby Moses is rolling over in his grave somewhere). I knew that! I've got a link somewhere. 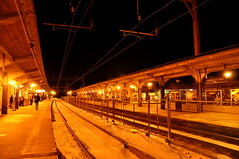 Patrick Boylan wrote: If those trains were empty I'd agree with your twice mentioned "too many". Are there passengers on the trains NJT runs into Penn Station? If so, why do you say there are too many trains? What do you expect those former passengers to do if someone stops running the trains because there are too many? Back to Hoboken and the ferry? Bring the businesses and corporations to Hoboken, Jersey City and Newark and have people commute to those places? morris&essex4ever wrote: Bring the businesses and corporations to Hoboken, Jersey City and Newark and have people commute to those places? This is the acceptable answer. Solves Amtrak's problems. Saves billions. Adds billions to New Jersey's tax revenues. That may be an acceptable answer for New Jersey. Not so much for New York. Why not just have them all commute to Philly or Wilmington? joshuahouse wrote: That may be an acceptable answer for New Jersey. Not so much for New York. Why not just have them all commute to Philly or Wilmington? Schumer is merely a latcher-on. His preferred way of getting from New York to Washington DC is flying.